has gone too far. It is called heartburn, not because it has anything to do with your heart, but because the burning sensation feels like it is coming from your chest. It can feel sharp, burning or tightening, often mimicking symptoms of a heart attack. Acid Reflux has all the same symptoms of the above mentioned (Heartburn and Indigestion) with the addition of bad breath, nausea, vomiting, persistent dry cough, trouble swallowing, laryngitis, and sleep disturbances. With Acid Reflux, you may have difficulty swallowing or it may feel like you have a lump in your throat. You may also find yourself regurgitating food. Acid Reflux is rightly named, as it is the backward flow of stomach acid into the esophagus, which is the tube that leads from your throat to your stomach. If left untreated, Acid Reflux can progress into GERD (Gastroesophageal Reflux Disease), which affects the lower esophageal sphincter and causes serious health issues. What causes Acid Reflux and GERD? During the normal process of digestion, the lower esophageal sphincter (LES) opens to allow food to pass into the stomach and closes to prevent food and acidic stomach juices from flowing back into the esophagus. Reflux occurs when that sphincter is weak or malfunctioning, allowing your stomach contents, including hydrochloric stomach acids, to flow upwards. Some factors that may cause or aggravate Acid Reflux and GERD are obesity, hiatal hernia, pregnancy, delayed stomach emptying, IBS, smoking and some medications. not have enough stomach acid to help counteract parasites and other pathogens, unhealthy bacteria can grow, putrefy in your stomach and produce painful digestive symptoms, apply pressure to the Lower Esophageal Sphincter (LES), cause it to malfunction and force stomach contents up into the esophagus. 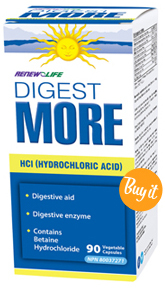 Instead of reaching for Tums try Renew Life DigestMore HCI – it is a digestive enzyme formula that contains Betaine Hydrochloride (HCl). 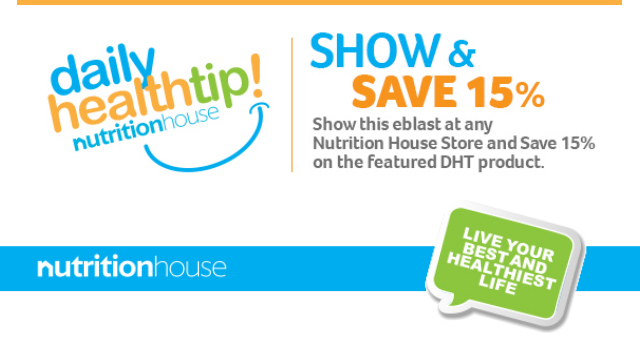 It is helpful for those who suffer from heartburn caused by low stomach acid. 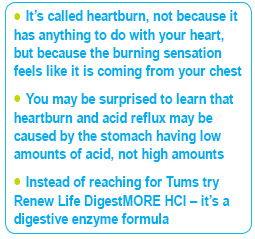 By ensuring adequate levels of hydrochloric acid in the stomach, especially at meal times, the underlying cause of most heartburn can be addressed. A daily probiotic, such as Renew Life 30 Billon Shelf Stable Ultimate Probiotic can support healthy bacteria balance in your intestinal tract and reduce gas and bloating that may force stomach contents up into the esophagus. 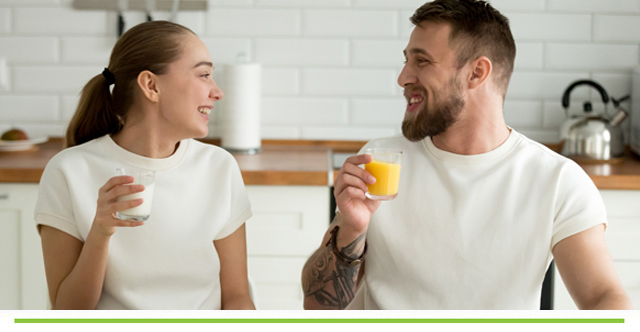 Renew Life IntestiNEW contains ingredients, such as L-Glutamine and N-acetyl-glucosamine, which work together to soothe, reduce inflammation and heal the damaged areas of the intestinal tract. If you need instant relief, keep Aloe Vera Juice (internal use) on hand, as it can help soothe the esophagus and ease stomach distress. Chewing DGL Deglycyrrhizinated licorice (DGL), Chewable Ginger, Fennel Seeds or sipping Fennel tea can also reduce stomach discomfort. Speak to your health care provider to discuss these natural options and to ensure there are no interactions with your prescribed medications.